BRIGHTON Council’s successful resource-sharing initiatives have been recognised by its local government peers. 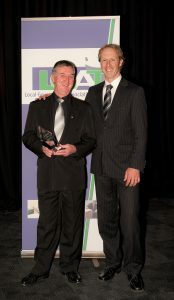 Council’s unique business model has been rewarded for demonstrating operational excellence with an award presented at this year’s Local Government Association (LGAT) awards for excellence. The award is for Council’s outstanding common service provision model that allows it to share its staff and resources with other councils both in Tasmania and more recently in its partnerships with interstate councils as well as the development of a sister city relationship with Suva in Fiji. At the awards event, Mayor of Brighton Council Tony Foster with Brighton’s business development manager Robert Higgins. LGAT CEO Allan Garcia commended Brighton Council for managing its resources in a way that not only provides assistance to other councils, but also brings in revenue for the benefit of their ratepayers. “The Brighton community is benefiting from Council’s common service model through enhanced services and minimal rates increases,” Mr Garcia said. “Brighton Council has provided a fantastic example of how entrepreneurship and resource sharing can help Local Government achieve sustainability in the long-term. “In addition to outsourcing its resources locally, Brighton Council has also developed operational software that is now used by nine Tasmanian councils, three councils in Western Australia, two in New South Wales and Suva City Council in Fiji,” Mr Garcia said. Mayor Tony Foster said Council’s resource-sharing business had brought enormous benefits to Brighton and had demonstrated how a unique model could be used to cost effectively assist other councils no matter where they are located. “We have developed a unique model to assist like-minded councils with resource-sharing and service provision and importantly, it is bearing fruit both here in Tasmania, interstate and overseas. “The real benefit is in the development of our talented staff, the efficiencies and economies of scale we achieve and importantly the income Brighton earns that is used to benefit our ratepayers and community,” Cr Foster said.